Manchester City could face a ban from next season's Champions League over alleged deceptions of Uefa's financial rules revealed in the Football Leaks scandal. European football's governing body believe a potential transfer embargo is not a sufficient punishment for the Premier League champions if an independent inquiry into Financial Fair Play (FFP) rules against the club in the coming days. Senior Uefa officials - who previously launched sanctions against City in 2014 - are particularly enraged by leaked files from 2015, which claim almost £60 million was paid directly into the club by their billionaire Arab owners but declared as sponsorship. 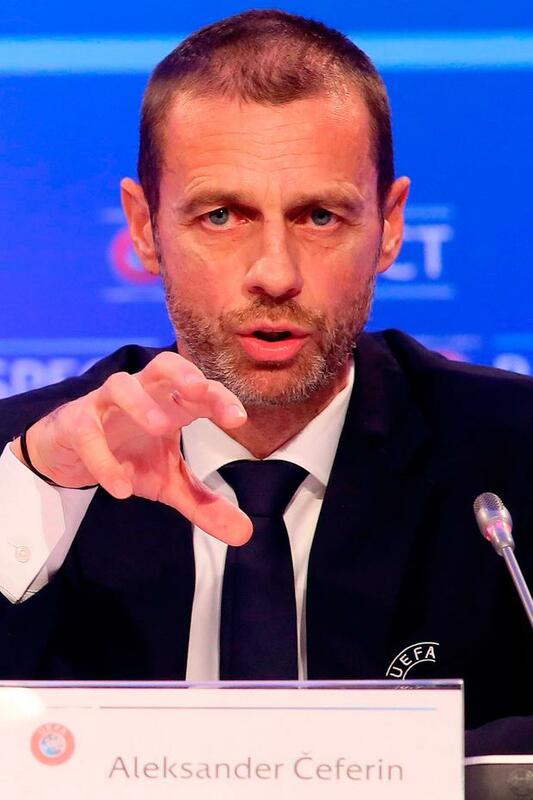 Speaking in Dublin yesterday, UEFA president Aleksander Ceferin appeared to indicate the allegations of FFP breaches were a "concrete case". The documents, allegedly obtained by illegal email hacks, are said to show £59.5m that was supposed to have come from City's principal sponsor Etihad Airways - which sponsors the club's stadium, shirts and training ground - was paid directly to the club by the Abu Dhabi United Group. To put that into context, City's record signing is Riyad Mahrez, who cost £60m from Leicester City last season. Ceferin, speaking after a meeting of Uefa executives, said: "We are assessing the situation. We have an independent body working on it. Very soon we will have the answers on what will happen in this concrete case." According to a report in German magazine 'Der Spiegel' last month, City breached FFP rules by €188m in 2014. City owner Sheikh Mansour was accused of funding significant parts of so-called deals with club sponsors in an attempt to escape Uefa sanctions. 'Der Spiegel' also alleged that City set up a secret scheme called 'Project Longbow', which effectively hid about £40m in payments to players, after the club had agreed a €20m fine as a settlement for FFP breaches. However, City have claimed "the attempt to damage the club's reputation is organised and clear" and said they "will not be providing any comment on out-of-context materials purportedly hacked or stolen from City Football Group and Man City personnel and associated people". Uefa issued a statement last week confirming that previous cases could be reopened if new information came to light, and that previously undisclosed information could also be used. It said: "Uefa conducts an annual assessment of all clubs against the break-even requirements of FFP on a rolling three-year basis. If new information comes to light, that may be material to this assessment, Uefa will use that to challenge the figures. "Should new information suggest that previously concluded cases have been abused, those cases may be capable of being reopened." Among other potential breaches of Uefa rules, 'Der Spiegel' published emails from 2010, reportedly from board member Simon Pearce communicating with colleagues, in which he discusses a £15m deal with partner Aabar. "As we discussed, the annual direct obligation for Aabar is £3 million," he allegedly wrote. "The remaining £12 million will come from alternative sources provided by His Highness (City owner, Sheikh Mansour)." In another message, City's chief financial officer, Jorge Chumillas, allegedly wrote that the club faced a £9.9m shortfall to comply with FFP thanks to the contract termination of manager Roberto Mancini. The Italian was sacked in 2013, a year to the day after winning the Premier League title. His giant pay-off meant yet more expenditure on City's books that had to be covered by income under Uefa rules. City were also accused of manipulating other sponsorship deals by backdating them. 'Der Spiegel' reported that City and Paris St-Germain breached FFP rules by €188m and €215m in 2014. Javier Tebas, chief executive of Spanish football's top division and a long-standing critic of City, has previously expressed doubts over whether City or French club Paris St-Germain would face sanctions because of a tangled web of financial relationships between the clubs and Uefa. Tebas has expressed fears that the governing body's links with broadcaster beIN Sports, which has committed billions of pounds to televise Champions League matches and other competitions, present an obstacle to Uefa acting.